This one arrived direct from the land of Arnold Schwarzenegger and...ermm...Arnold Schwarzenegger yesterday. 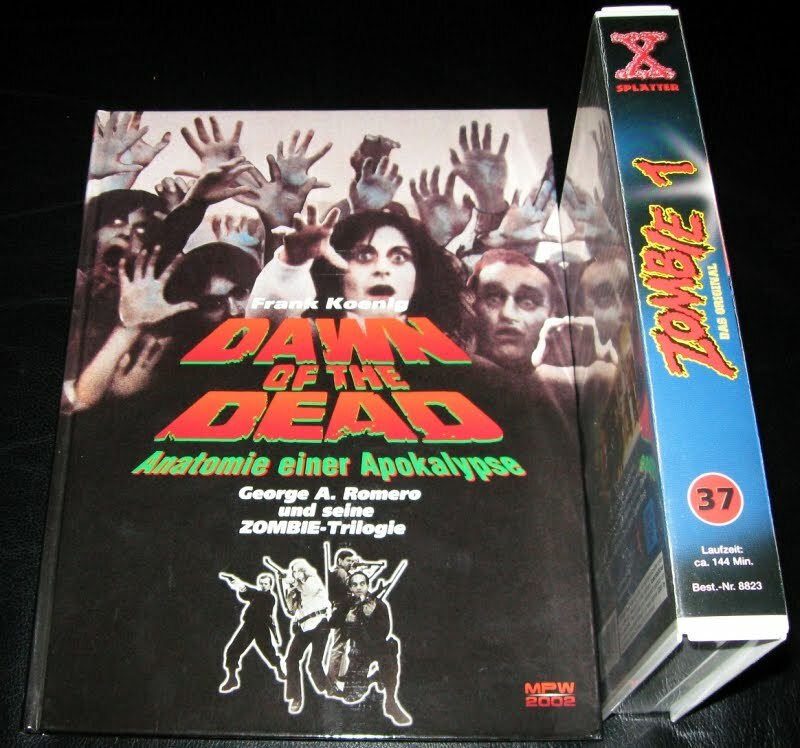 It's X-Rated Kult Video's PAL video standard VHS of Romero's Dawn of the Dead released in 2001 as a dual-country edition (thanks to Louis from Massacre Video and Abomination). 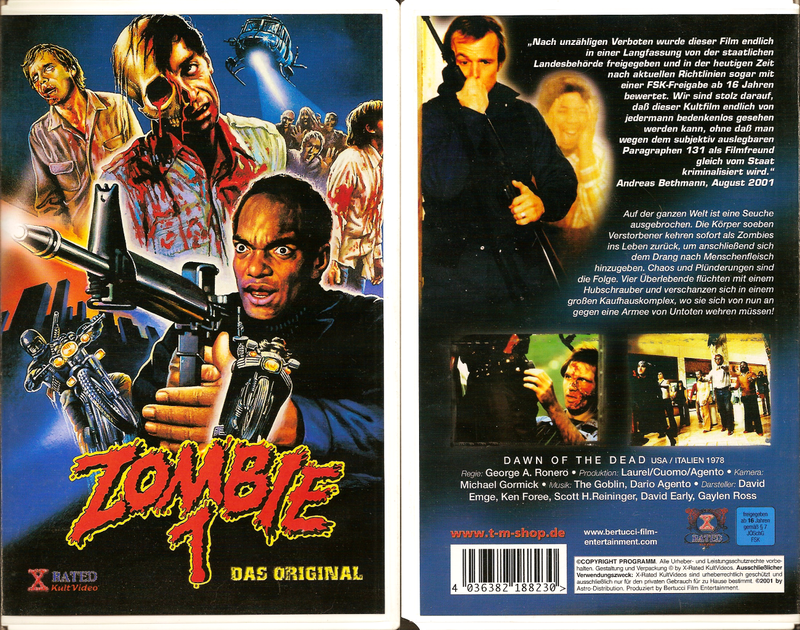 This clamshell-cased tape features a double-sided cover with the first scan below being the Austrian side. Notice the more graphic stills on the back and no rating. The spine also states a runtime of 156 minutes (159 in NTSC) which reflects Oliver Krekel's unauthorized "ultimate final" version. This version edits together all footage unique to each version of the film to create one dubbed in German cut that's the longest version available. The second cover below is the German side sporting less graphic stills and a FSK-16 rating. The spine states a 144 minute runtime chopped down from the ultimate final cut. The Andreas Bethmann quote on the back seems to be a to-the-point explaination that it would be illegal to distribute the full "long version" under German law. Notice the spelling errors, "Ronero", on the back cover credits in both covers. 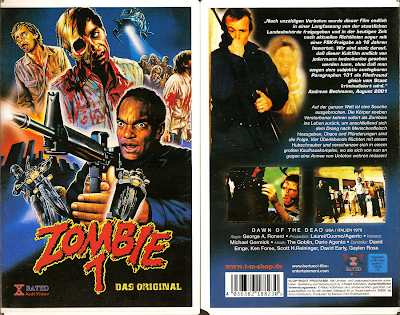 The tape included is the Austrian edition with 156 minutes printed on its label. 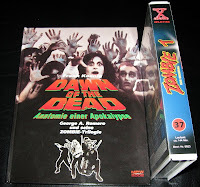 Aside from the big colorful clamshell artwork, I grabbed this tape because it makes a good "pseudo-pairing" with my copy of Frank Koenig's book, Dawn of the Dead: Anatomie einer Apokalypse. 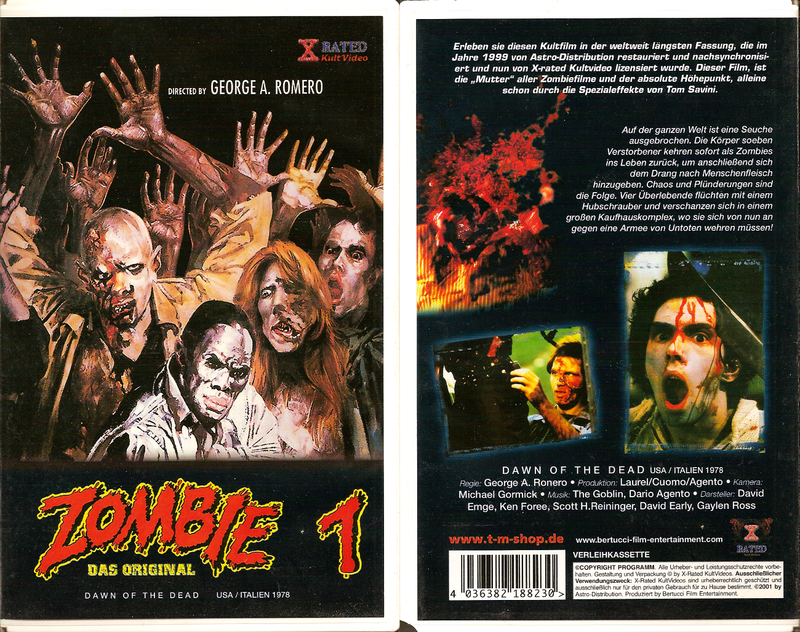 Koenig's 256-page, German-text guide to Romero's trilogy was released in 2002 through Medien Publikations und Werbegesellschaft (MPW 2000). So they just seem meant to be together. Oh my! This looks pretty awesome. Thanks!